Married Name 16 June 1938 As of 16 June 1938,her married name was Rogers. Evelyn Dorothea Luella Hasz was born on 7 May 1918 at Sauk, Wisconsin. She was the daughter of Frederick Hasz and Ella Soltwedel. Evelyn Dorothea Luella Hasz married Harley L. Rogers on 16 June 1938. Evelyn Dorothea Luella Hasz died on 4 June 2010 at age 92 Evelyn, age 92 of Baraboo, died peacefully in her sleep with family by her side at home on Friday, June 4, 2010. Evelyn, the daughter of the late Frederick and Ella (Soltwedel) Hasz, was born on May 7, 1918 in Loganville, Wis. She was married to Harley L. Rogers from Aurora, Ill. on June 16, 1938. Evelyn worked at Flambeau Plastics, Baraboo Floral, and St. Vincent DePaul's. After retiring at age 74, Evelyn continued her charity work for St. Vincent's until the time of her death. She loved gardening, there wasn't a flower she didn't know or couldn't grow. She also enjoyed traveling and collecting. Evelyn is survived by children, Kim Harlene Rogers, Harley "Ed" (Judy) Rogers, Judy (Claude) Acheson, Kathy (Mahlon) Peterson, Mary (Bart) Scarborough, Pat (Bob-wanna be Rogers) Wedekind, Teri Scott, John (Diana) Rogers, Tim (Lisa) Rogers, Tami (Rod) Keegan, and Ted (Lisa) Rogers; 38 grandchildren; 32 great-grandchildren; a brother-in-law, Marvin "Foxy" Fisher; nieces; nephews; other relatives and friends. 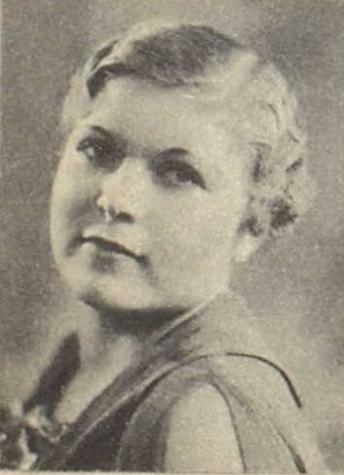 In addition to her parents, Evelyn was preceded in death by her husband, Harley; grandson, Kenneth Rogers; sisters, Margaret Ritzenthaler and Lucille Fisher; and brother, Edward Hasz. Visitation for Evelyn will be held on Tuesday, June 8, 2010 from 1 p.m. until 3 p.m. at the Redlin Funeral Home, 401 Madison Avenue in Baraboo. A graveside service will be held at 3 p.m. on Tuesday at St. Joseph's Catholic Cemetery in Baraboo with Father Larry Bakke officiating. 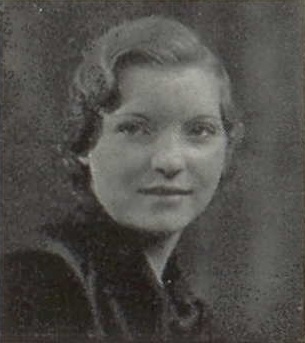 Evelyn Dorothea Luella Hasz graduated in 1936 at Reedsburg High School, Reedsburg, Sauk, Wisconsin. Harley L. Rogers married Evelyn Dorothea Luella Hasz, daughter of Frederick Hasz and Ella Soltwedel, on 16 June 1938. Harley L. Rogers died before June 2010. Name Variation Margaret Hasz was also known as Margeruite. Married Name Her married name was Ritzenthaler. Margaret Hasz married Edward Ritzenthaler. Margaret Hasz was born on 25 September 1912 at Wisconsin. Margaret Hasz died on 8 July 1988 at Sauk, Wisconsin, at age 75. Edward Ritzenthaler married Margaret Hasz, daughter of Frederick Hasz and Ella Soltwedel. Edward Ritzenthaler was born in October 1894 at Wisconsin. He died on 26 December 1968 at Dane, Wisconsin, at age 74. Lucille Hasz married Marvin Fisher. Lucille Hasz was born on 13 July 1915 at Wisconsin. Lucille Hasz died on 9 January 2003 at Sauk, Wisconsin, at age 87 REEDSBURG - Lucille M. Fisher, age 87, of Reedsburg, died on Thursday, January 9, 2003, at Sauk County Health Care Center. She was born on July 14, 1915, in Loganville, the daughter of Fred and Ella (Soltwedl) Hasz. On June 29, 1947, she was married to Marvin E. Fisher. She was preceded in death by a sister, Margaret Ritzenthaler; and a brother, Edward Hasz. Lucille Hasz graduated in 1934 at Reedsburg High School, Reedsburg, Sauk, Wisconsin. Marvin Fisher married Lucille Hasz, daughter of Frederick Hasz and Ella Soltwedel. Edward Hasz was born on 23 March 1914 at Wisconsin. He was the son of Frederick Hasz and Ella Soltwedel. Edward Hasz died on 3 September 2000 at Dane, Wisconsin, at age 86. Ruth Ellen Lockhart was born on 14 June 1939 at Gardenplain, Whiteside, Illinois. She was the daughter of Dwight S. Lockhart and Jane Holle. Ruth Ellen Lockhart died on 11 December 1939 at Gardenplain, Whiteside, Illinois. She was buried on 13 December 1939 at York, Carroll, Illinois. Baby girl Lockhart died on 13 May 1864. She was born on 13 May 1864. 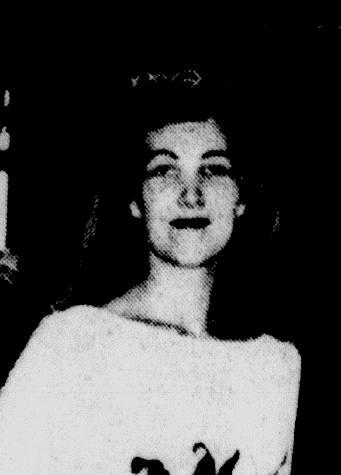 She was the daughter of Andrew Lockhart and Nancy Randall. Name Variation Elisha Lockheart was also known as Lockhart. Elisha Lockheart was born on 21 May 1821 at Greene, Ohio. He was the son of Robert Ellison Lockhart and Sarah Hemphill. Elisha Lockheart married Rebecca Rinard on 16 November 1852. Elisha Lockheart died on 2 April 1896 at age 74. He was buried after 2 April 1896 at Cottonwood Cemetery, Ustick, Whiteside, Illinois. In 1885 Elisha Lockheart, one of the leading agriculturists of Garden Plain Township, was born May 21, 1821, in Greene Township, Adams Co., Ohio. He is the second son of Robert E. and Sarah (Hemphill) Lockheart. The first business in which he was engaged was as a help manager of a wood-yard, at the head of Brush Creek Island in the Ohio River, for the purpose of supplying steamboats with fuel. He was then but 12 years of age, and he continued to help conduct the affairs of the wood station until 1852, when he married, and ran a rented farm until 1856. In the fall of 1845 he came to Whiteside County and entered 231 acres of land, 200 of which was was prairie, situated on section 11, of township 21, range 3. He made the remainder of his claim on section 8, consisting of 30 acres of timber. After he reached the age of 21 years he entered into an engagement with his father for $100 yearly salary, and his board and clothes. He came West in 1845 with three years salary, and secured his land. He went back to Adams County, where he engaged in the pursuit of agriculture and the wood business, until 1856. He then made a permanent removal to Whiteside County, and located on section 27 of Garden Plain Township, where he improved a farm. In 1858 he took possession of the land he had formerly located on section 11, and which was still in a wholly wild state. It is at present writing in a state of advanced cultivation, and he has increased his possessions until he is now the owner of a valuable estate, comprising 872 acres of land, all of which is under tillage, with the exception of 51 acres of timber. He also owns 160 acres of land in Poweshiek County, Iowa, and 120 acres in Morris County, Kan. Mr. Lockheart has rented his land, and is living in retirement. He was united in marriage Nov. 16, 1852, to Rebecca Rinard. She was born Dec. 27, 1825, in Washington Co., Ohio, and died Feb. 20, 1885, and was interred in the Cottonwood Cemetery, Ustick Township. While the death of Mrs. Lockheart inflicted an irreparable loss, she accomplished much more than the usual lot in the influence she exerted in her home and in social circles. She was all that the terms wife, friend and neighbor imply. [S186] Illinois, Illinois Statewide Marriage Index, license 00007402. Married Name 16 November 1852 As of 16 November 1852,her married name was Lockheart. Married Name 16 November 1852 As of 16 November 1852,her married name was Lockhart. Rebecca Rinard was born on 27 December 1825 at Ohio. She married Elisha Lockheart, son of Robert Ellison Lockhart and Sarah Hemphill, on 16 November 1852. Rebecca Rinard died on 20 February 1885 at age 59. She was buried after 20 February 1885 at Cottonwood Cemetery, Ustick, Whiteside, Illinois. Alexander Randall married Hannah Newman. Married Name Her married name was Randall. Hannah Newman married Alexander Randall. Benjamin Grant Hamilton married Anna Marie Schmelzer, daughter of David J. Schmelzer and Mary M. Dederich. Benjamin Grant Hamilton died before July 2008. Benjamin D. Hamilton was the son of Benjamin Grant Hamilton and Anna Marie Schmelzer. Benjamin D. Hamilton died before July 2008. Married Name 15 June 1961 As of 15 June 1961,her married name was Lockhart. Wilma Feather was born before 1943. She was the daughter of Paul Feather. 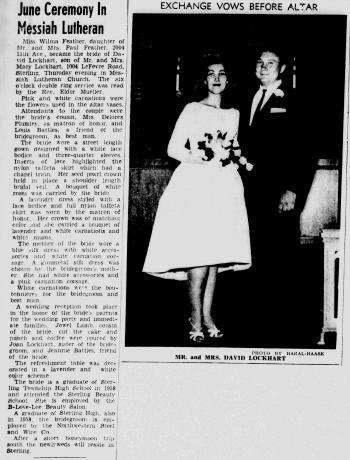 Wilma Feather married David Henry Lockhart, son of Macy James Lockhart and Frieda Marie Friede, on 15 June 1961 at Sterling, Whiteside, Illinois, Wilma Feather and David Lockhart marriage announcement. Name Variation Maria Alt was also known as Mary. Name Variation Maria Alt was also known as Marie. Married Name 22 February 1876 As of 22 February 1876,her married name was Weber. Maria Alt was born on 3 January 1858 at Wisconsin. She was the daughter of Johannes Alt and Magdalena Conrad. Maria Alt married Joseph Weber on 22 February 1876. Maria Alt died on 18 September 1891 at age 33. Joseph Weber was born on 20 September 1847 at Galena, Illinois. He married Maria Alt, daughter of Johannes Alt and Magdalena Conrad, on 22 February 1876. Joseph Weber died on 18 November 1926 at age 79 Joseph Weber, one of the oldest settlers of Grant county, Wisconsin, died at the home of his daughter, Mrs. John Wiederholt, near Louisburg, Friday afternoon, at 4:45 o'clock. The funeral will be held Monday morning from the Wiederholt home to the Immaculate Conception church, Kieler, where a requiem mass will be read at 10 o'clock. Burial will be made in the adjoining cemetery. Mr. Weber was born at Galena, Sept. 20, 1844. He was the son of Mr. and Mrs. Joseph Weber, pioneers of that community, who immigrated from Eichsfell Rhenich, Prussia, and lived for many years on the old homestead near Fairplay, Wis. Mr. Weber married Marie Alt, February 22, 1876. He was a steadfast member of St. Mary's Immaculate Conception church, Kieler, and passed away fortified by the last rites of his faith. 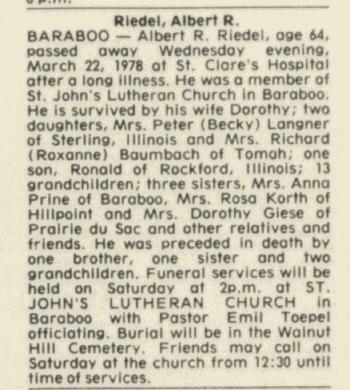 He is survived by four daughters, Mrs. Charles Ihm, Mrs. John Wiederholt, Mrs. John Kaiser, and Mrs. Leonard Hartung, two sons, Joseph and John Weber, all of Grant county; two sisters, Mrs. John Demuth, Woodstock, Minn., and Mrs. Joseph Wiederholt, Lisbon, N.D; one brother, Jacob Weber, Dubuque; also 48 grandchildren and two great-grandchildren. His wife, two daughters and two sons, preceded him in death several years ago. Elizabeth Alt was born circa 1855 at Wisconsin. Elizabeth Alt died before 1929. Dorothy H. Alt was born in 1859 at Wisconsin. 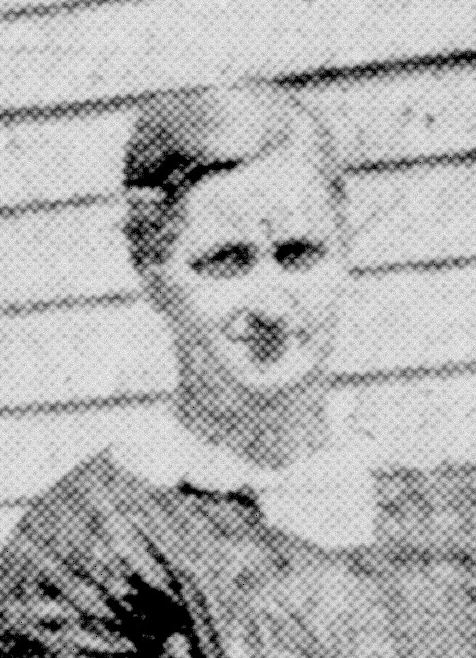 Dorothy H. Alt died before 1929. Mary Elizabeth Alt was born in 1864 at Wisconsin. Mary Elizabeth Alt died before 1929. Married Name circa 1890 As of circa 1890,her married name was Kirchberg. Lucy Alt was born on 2 March 1868 at Wisconsin also reported as Apr 1868. Lucy Alt married Charles Kirchberg, son of Johann Michael Kirchberg and Maria Lichtenberg, circa 1890. 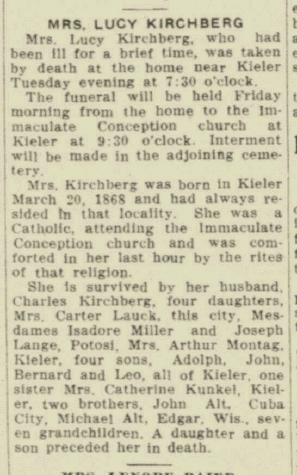 Lucy Alt died in July 1929 at Kieler, Grant, Wisconsin, at age 61 Lucy (Alt) Kirchberg obituary. Margaret Alt was born circa 1870 at Wisconsin. Margaret Alt died before 1929. Name Variation John Michael Alt was also known as Michael. John Michael Alt was born in 1871 at Wisconsin. He was the son of Johannes Alt and Magdalena Conrad. John Michael Alt died after 1942. Name Variation Mary Brant was also known as Brandt. Married Name 23 May 1899 As of 23 May 1899,her married name was Wiederhold. Married Name 23 May 1899 As of 23 May 1899,her married name was Wiederholt. Mary Brant was born on 6 June 1881 at Kieler, Grant, Wisconsin. She was the daughter of Joseph Brandt and Dora Haas. 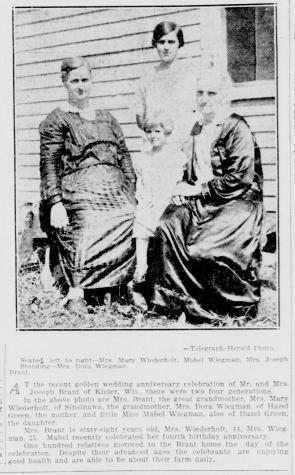 Mary Brant married William Joseph Wiederholt, son of Joseph Christian Wiederholt and Gertrude Digmann, on 23 May 1899 at Kieler, Grant, Wisconsin, Mr Joe Kellner and sister, Miss Jennie, were guests at the Wiederholdt-Brandt wedding at Kieler. Mary Brant died on 6 December 1941 at age 60 Mrs. Mary Wiederhold, 60, died at 5 o'clock Saturday morning at her farm home near Louisburg following a lingering illness. Funeral services will be held Tuesday morning at 9 o'clock at St. Francis Church at Hazel Green with the Rev. M.J. Kenney, pastor, celebrating the requiem mass. Burial will be in the adjoining cemetery. Mrs. Wiederhold was the former Mary Brant and was born June 6, 1881 at Kieler, a daughter of Mr. and Mrs. Joseph Brant. She was married in May, 1898 to William Wiederhold, who died a number of years ago. Surviving are five daughters: Mrs. Clem Wiegman of near Louisburg, Mrs. William Brandt of near Shullsburg, Mrs. Charles Ahrendt of Janesville, Mrs. Joe Simon of Lakeville, Minn., and Orpha, at home; three sons, Wilbur of Cuba City and Carl and Earl, both at home; six sisters, Mrs. Charles Bauers, Mrs. Christine Simon, and Mrs. Nicholas Simon, all of Cuba City; Mrs. Joseph Stohlmeyer of Platteville, and Mrs. Leonard Wiegman and Mrs. Joseph Schuller, both of Dubuque; two brothers, August Brant of Kieler and Arthur of Cuba City; and 24 grandchildren. Three daughters and one son also preceded her in death. In September 1925 at Kieler, Grant, Wisconsin, Joseph and Dora (Haas) Brant celebrate 50th wedding anniversary. In September 1925 4 generations picture taken at 50th wedding anniversary - Wiederholt. Name Variation William Joseph Wiederholt was also known as Wiederhold. William Joseph Wiederholt was born on 16 November 1873 at Paris, Grant, Wisconsin. He was the son of Joseph Christian Wiederholt and Gertrude Digmann. William Joseph Wiederholt married Mary Brant, daughter of Joseph Brandt and Dora Haas, on 23 May 1899 at Kieler, Grant, Wisconsin, Mr Joe Kellner and sister, Miss Jennie, were guests at the Wiederholdt-Brandt wedding at Kieler. William Joseph Wiederholt died in September 1931 at age 57 William Joseph Wiederholt, 57, obituary. Farmer loses life in creek on own farm - Automobile backs down grade intro creek and then turns over. Name Variation Curtis Ullery was also known as Curtiss. 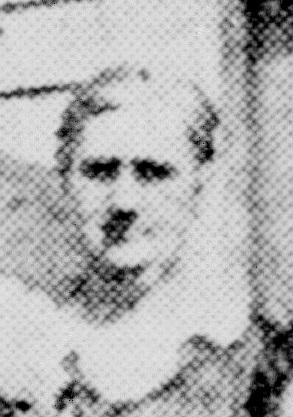 Curtis Ullery married Audrey A. Baumbach, daughter of Adolph Julius Baumbach and Meta Anna Ida Friede. Hallet Jenkins married Theresa Baumbach, daughter of William Baumbach and Bertha Maria Dorothea Schamens. Clayton Thompson married Meta Baumbach, daughter of William Baumbach and Bertha Maria Dorothea Schamens. Albert Riedel married Dorothy E. Lutz. Albert Riedel was born on 14 April 1913. He was the son of Christ Riedel and Minnie (?). 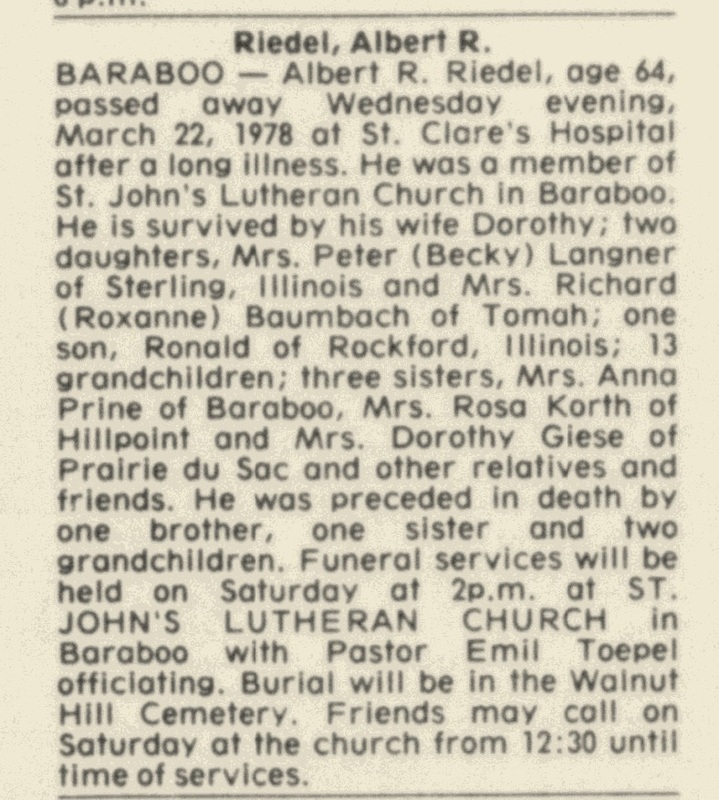 Albert Riedel died in March 1978 at age 64 Albert Riedel obituary. [S250] U.S. Federal Census 1930 U.S. Federal Census, by Ancestry.com, Year: 1930; Census Place: Washington, Sauk, Wisconsin; Roll: 2609; Page: 5B; Enumeration District: 0038; Image: 503.0; FHL microfilm: 2342343.